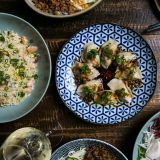 China Diner Bondi can be booked out exclusively Monday to Saturday lunch for groups of 60-90 guests for a sit down event, or up to 120 guests for a stand up style event. A perfect space for corporate functions, end of year events, product launches & Birthday celebrations. Booking out the restaurant also includes exclusive use of the Bar for pre-lunch drinks. The venue is entirely yours from 12pm-5pm. Please fill in your information below and Margot or Alice will contact you as soon as possible to book your event. If you’d prefer to talk now, please call us at (02) 9130 2333.